The West Midlands is a region of contrasts with g enerously endowed pastoral countryside and the rich Black Country heritage. It has few obvious tourist honeypots, making it an ideal region to discover on foot. Including Ordnance Survey mapping and superbly priced at just £4.99, Walks for all Ages - 20 Circular Walks in The Black Country is the perfect accompaniment for a stroll in the area. Staffordshire offers a wide range of delights for the walker - from the windswept Peak District through riverside walks to picturesque villages. The north-south hill range we call the Malvern Hills is unique in England, a sort of miniature mountain range of very ancient rocks that rises out of comparatively lowly territory on all sides. Discover the best of Gloucestershire by foot with this beautifully presented, slim line walking guide exploring 50 of the regions best routes of 2 to 10 miles. Discover Hereforeshire & Worcestershire at its best.... by foot. 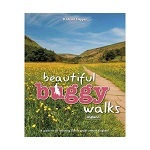 This beautifully presented, slim line walking guide explores 50 of the regions best routes of 2 to 10 miles. Discover the best of spectacular Shropshire by foot with this beautifully presented, slim line walking guide exploring 50 of the regions best routes of 2 to 10 miles. Whether you fancy a a leisurely stroll around Stoke-on- Trent's Potteries or a brisk stomp up the Hanchurch Hills, this walking guide offers something for all abilities and boasts 50 of the regions best routes of 2 to 10 miles. 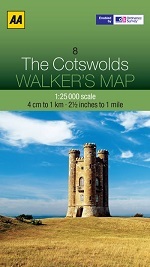 Discover the best of The Cotswolds by foot with this beautifully presented, slim line walking guide exploring 50 of the regions best routes of 2 to 10 miles. Discover the best of Warwickshire & West Midlands by foot with this beautifully presented, slim line walking guide exploring 50 of the regions best routes of 2 to 10 miles. The AA’s flagship new British guide series brings together the best of each region and some lesser-known gems. All the best places to visit in the region – things to see, things to do, food and drink, and what’s nearby. A new revised 3rd edition of this much loved guide contains 36 walks, including 7 completely new routes, located in all parts of the county.